I received access to The Secret World this week as part of their try out the game offer. 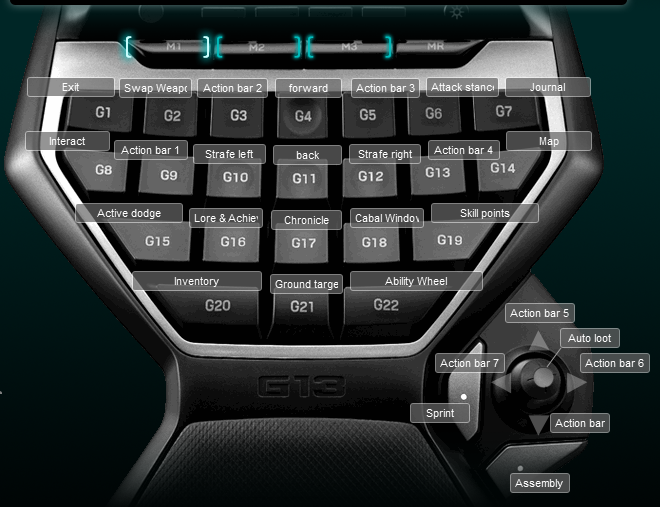 As with every other MMORPG my first step was to make a Logitech G13 profile that worked for me. I put together 2 profiles for The Secret World, The Secret World Logitech G13 Profile for DX11 and The Secret World Logitech G13 Profile, because the executable is different for the game based on your graphics settings. You can see a screen shot of the keyboard layout below. I found that the strafe left and right buttons were more useful in this game than turn left and right. I also put shift on my mouse button in order to access the extra keys. For this layout I moved the interact key out to G8 because I found you used it infrequently and you needed quicker access to the action slots.